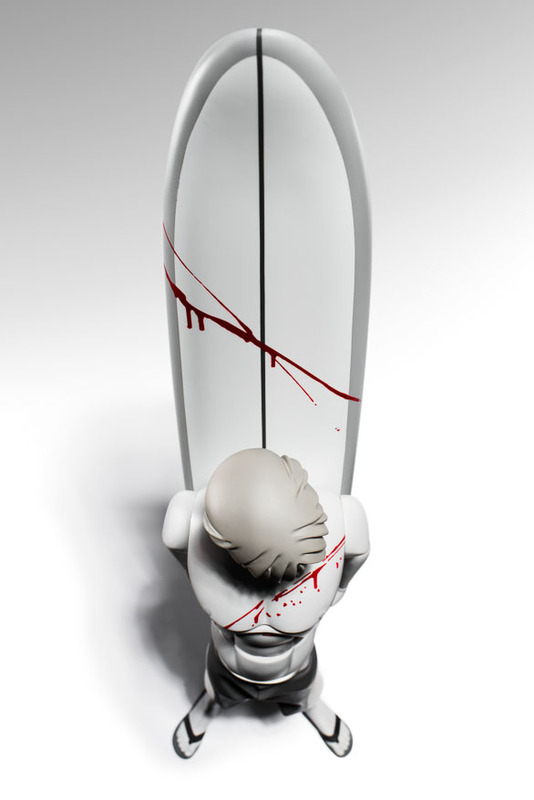 jaws wood is limited to 10 pieces and is exclusively available only at Artscouting-Gallery. 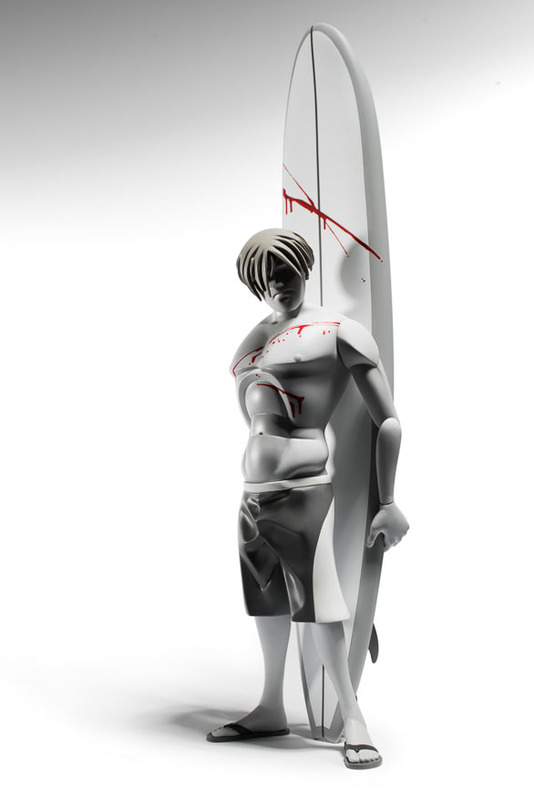 We released out first figures, Flake, Fluid, and Float, in 2004 during the early days of vinyl sculptures. 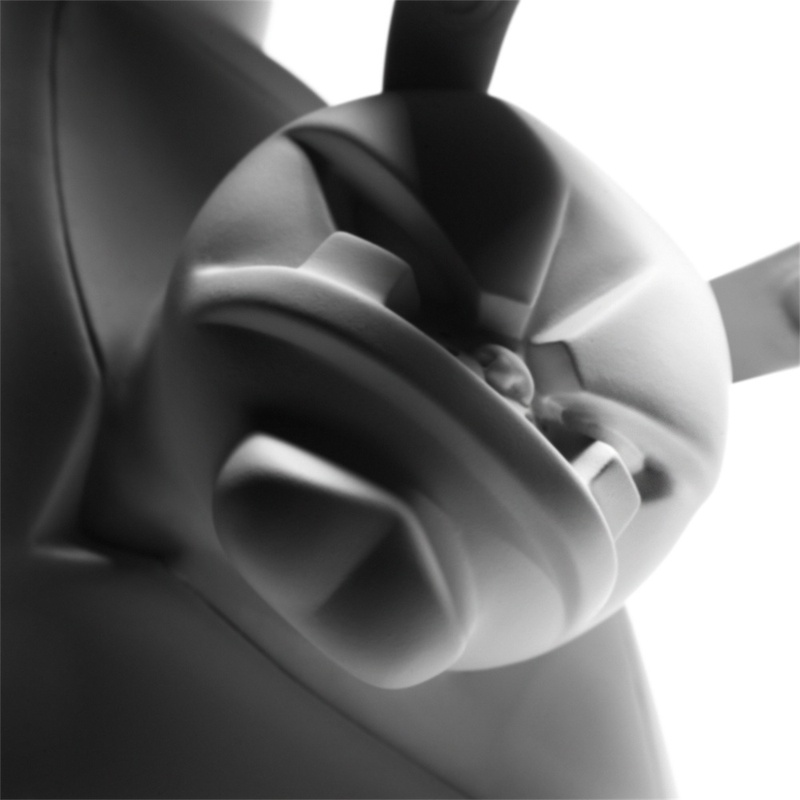 Over the past ten years, we have aimed to perfect our craft and push the boundaries of what vinyl figures can be. To celebrate this exciting ten-year milestone, we proudly present Flake, Fluid, and Float as re-sculpted, resized and revamped 2014 anniversary editions. 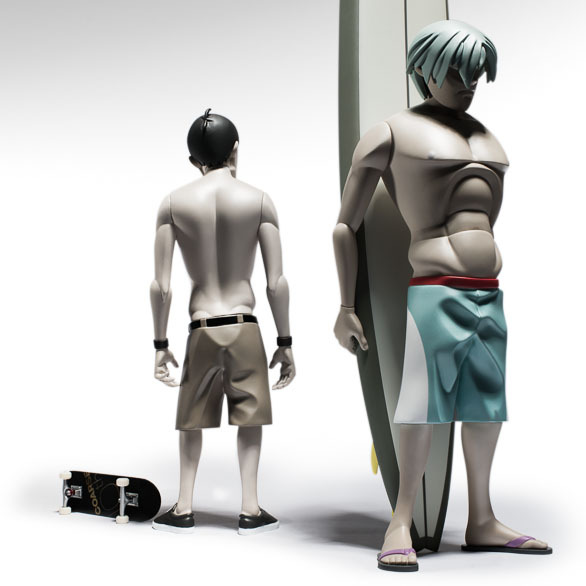 These newly developed figures will be released in impressive dimensions: Fluid’s longboard measures 18’’ [45 cm] and his body height is 12’’ [30 cm] from top to bottom. Packed in premium cardboard boxes and embedded in soft sponge, each set contains the two vinyl sculptures Flake and Fluid, and Float’s interchangeable head, which can fit onto Flake’s body. 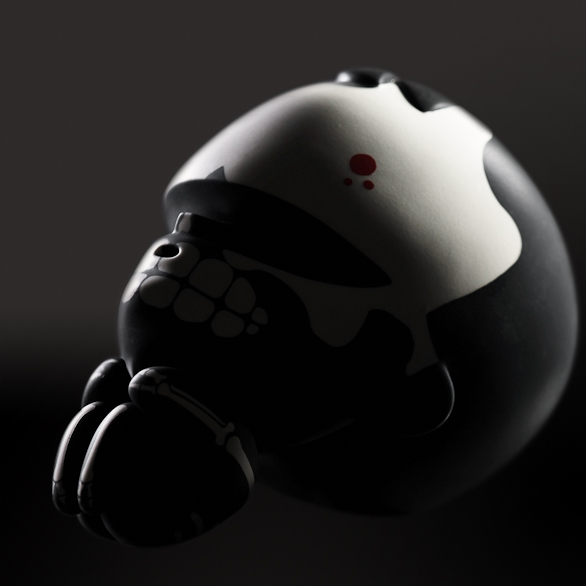 The cream edition will be limited to 320 pieces and the pain edition will be limited to 220 pieces. In 2003, Mark Landwehr began working on his first series of sculptures in the small town of Hannover, Germany. Sculpted and cast in resin, the finished pieces were presented to the public for the first time at the Plastic Particles Exhibition in Berlin in the summer of 2003. 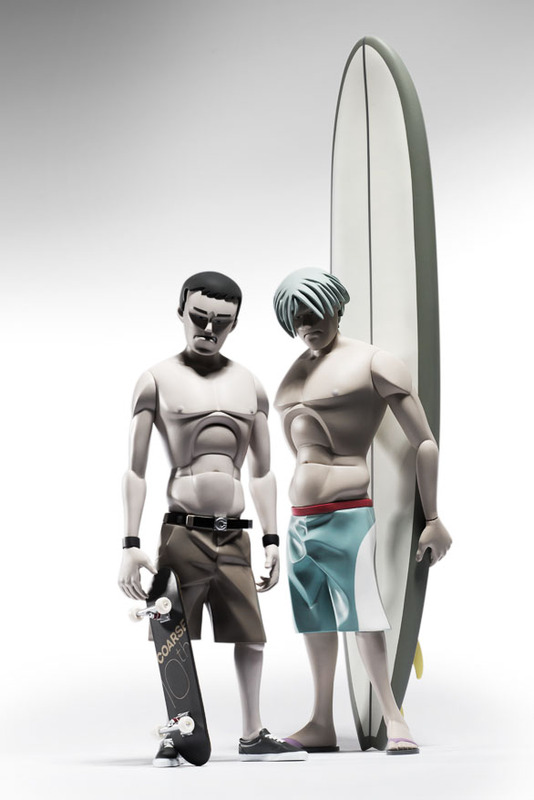 Several magazines ran photographic spreads of the figures, and as he gained recognition, the first series of figures was released in collaboration with Vans. These figures were Flake, Fluid, and Float, and they mark the birth of coarse. 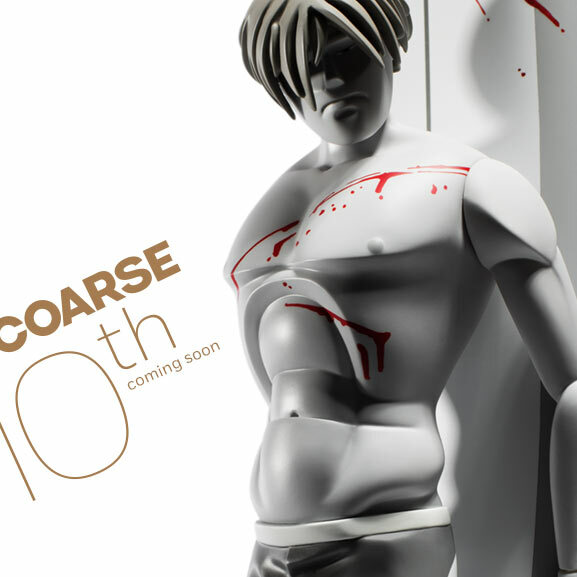 We could not be more thrilled to revisit them and share the early visions of coarse with you once again. On the outside, they resemble a fluid physicality, effortlessly connected to their surroundings. Meanwhile, inside a destructive nothingness stirs, waiting for the perfect moment to escape their empty shells in a beautiful display of rage. Though fearless, their existence is infinitely detached and without meaning – a burden to bear forever. coarse is on a mission to protect its rarest species. In order to salvage released editions, we are now offering one of our most iconic art figures, exposed in raw beauty. The 12'' paw! comes painted in untouched white. Keep him pure or turn paw! into your own one of a kind piece — we give the future of paw! into your hands. The tiny monkey–rabbit is cushioned in black sponge and packed securely in a carton box — covered in heavy art drawing paper, printed in light grey tones. Ready to take your signature. paw! raw is on sale for a limited time only. Burrowed deep in their wombs, oop and aw! wait patiently. Their bodies throb with fear and hope—the ingredients that make a good batch. The sounds of their bodies welding together lulls them into a daze. Not yet ready, they lie in a boundless cave of dullness. Above, predators are waiting for them to unfold into an isolated world cocooned in sunlight. They navigate their foreign bodies, flexing their limbs and pivoting their heads to gauge the landscape around them. Remaining optimistic, they creep forward, cautiously unsure of what might materialize in their path and in their wake. If oop and aw! could know what awaited them, they would stay in their fortified caverns for eternity. The unique set includes two 7” [18cm] vinyl figures showing the two premeditated victims as their predators perceive them; the unique set includes two 7” [18cm] vinyl figures. Each seedling is executed with a high attention to detail and has a semi-mat finish. They are secured in black sponge and packaged in a deluxe hand-crafted, silk screen-printed paper enclosure and closed with a photo-printed sleeve. Bring home these flesh and bones; maybe one day you will be up for a hunt. "THOMAS – le trou dans le vide"